Macaroni Gratin is a very popular home cooked dish in Japan. 1. Toast the grated parmesan cheese in a frying pan until golden brown and set aside. 2. Remove the skin from the chicken if desired. Then cut into small bite-size pieces and season with salt and pepper. Slice the potato into 5mm (0.2 inch) half rounds. Slice the onion. 3. Heat cooking oil in a frying pan and stir-fry (2.) until coated with oil. 4. Add macaroni, water, and consomme cube, then cook on medium for 3 minutes. 5. Add soy milk, when it becomes to a boil, stop the heat. Mix melted butter and flour in a small dish. Add them into the frying pan. Then put on low and simmer until the sauce thickens. 6. Season with salt and pepper, sprinkle with pizza cheese, cover, and cook on low for about 5 minutes. 7. 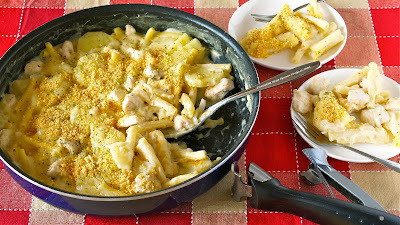 Taste the macaroni, when it is done, stop the heat, then sprinkle with the toasted parmesan cheese (1.) and parsley flakes to finish.